One common, yet false assumption about bees is that that their buzzing is caused by the beating of their wings. Not true. The sound is actually the result of the bee vibrating their flight muscles. This is especially pronounced in bumblebees, as they must warm up their bodies considerably to get airborne at low ambient temperatures. Yet, the sound they do produce while fearful to many humans has indeed inspired a good number of musical compositions over the years. Perhaps the "Flight of the Bumblebee" is the most famous "bee" inspired orchestral interlude ever written. Composed by Nikolai Rimsky-Korsakov for his opera, The Tale of Tsar Salton (circa 1899-1900), the piece designates the magical transition of the Prince into a bumblebee so that he can fly away to visit his father, who doesn't know he's alive. In 1947, "Bumblebee" was featured in a musical biopic of Rimsky-Korsakov's life, entitled, "Song of Scheherazade." The film starring Jean-Pierre Aumont as the composer and Yvonne De Carlo as a love interest, also featured some of the composer's other work including, "Song of India," "The Tale ofTsar Salton, "Hymn to the Sun," and "Scheherazade." Also in the 1940s, the "Laughing Record" took liberties with the tune, where the 'Flight of the Bumblebee" was interrupted repeatedly by wild laughter and sneezes by Spike Jones and his City Slickers band. The buzz created by Herb Albert & the Tijuana Brass with their rendition of "A Taste of Honey," gave bees a modern-hip sound in the 1960s, as horns replaced the piano in mimicking the buzzing of bees. In more recent times, undercurrents of the "Flight of the Bumblebee" were used to embellish Michael Jackson's pop hit, "Breaking News." Go to the :45 second mark. So who's been inspired by the sound of bees in the 21st Century? 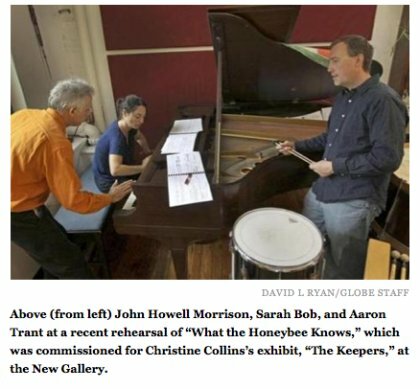 Well, at the New Gallery in Boston, John Howell Morrison was commissioned by Christine Collins' art exhibit "The Keepers" to debut his latest composition titled: "What the Honeybee Knows." Ironically, Morrison who is dangerously allergic to bees didn't visit the hives that Collins photographed, but he researched beekeeping extensively and listened to bees buzzing on YouTube. He ended up depicting a day in Photo from Christine Collins' art exhibit, "The Keepers" the life of a honeybee in a way that’s “ethereal rather than bombastic,” said the composer. In a Boston Globe post, it was reported that Morrison doesn't want to reveal too much about his piece prior to its debut. But suffice to say, he noted that the piano provides the "hive and the beekeeper's smoke, while percussion instruments track the bee's stops along the way." Unfortunately, since this musical hive of activity was just announced on May 5, 2012, we don't have a sample of Morrison's work to post here for your listening pleasure. But do check back to the post in the weeks to come, as I'm sure a version of it will make its way to YouTube. In the meantime, we'll leave the final word on "buzzing" to Tim Rice's 1973 musical "Jesus Christ Superstar." While there is no reference to bees in these lyrics of "What's the Buzz," obviously the etymological origin of the word "buzz" can be traced back to bees "stimulating interest by causing a stir," wherever they travel. And here, Christ's disciples want JC to explain the "buzz" his life on earth has caused. Super Meowio: The Top 5 Animal-Themed Mario Power-Ups!